I built an Estes Orbital Transport back in 1972 or 1973 and I still fly it on occassion. It's flown on everything from B6-2 to D8-6 (AeroTech) motors. Along the way it has become a bit flight-worn with many of the the decals damaged or missing. Even so, it has always performed well. 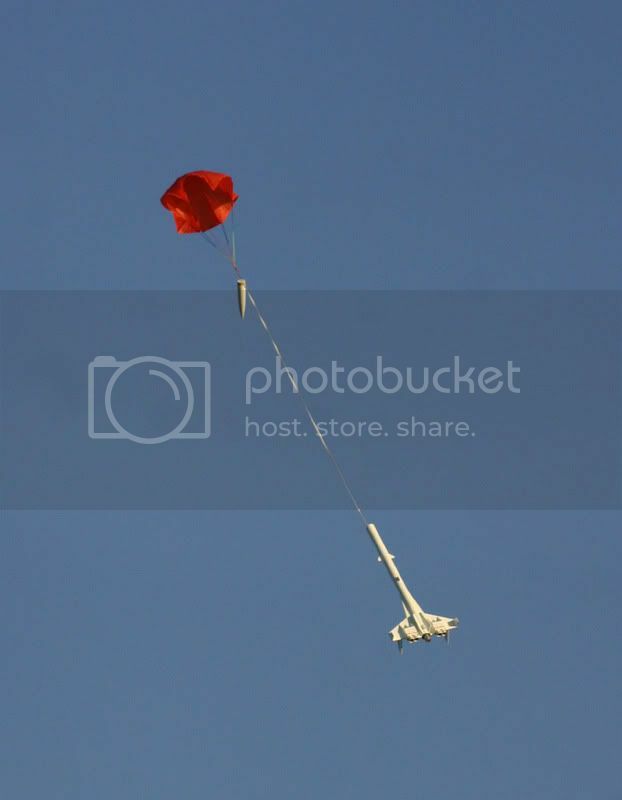 It is all the original parts except for the sustainer section parachute which is now a Cox 20" 'chute from one of their Saturn V models I crashed ( ). I took the OT to NARAM-52 to fly it. Powered by an Estes C6-5 motor, it had a beautiful flight into the Colorado sky. 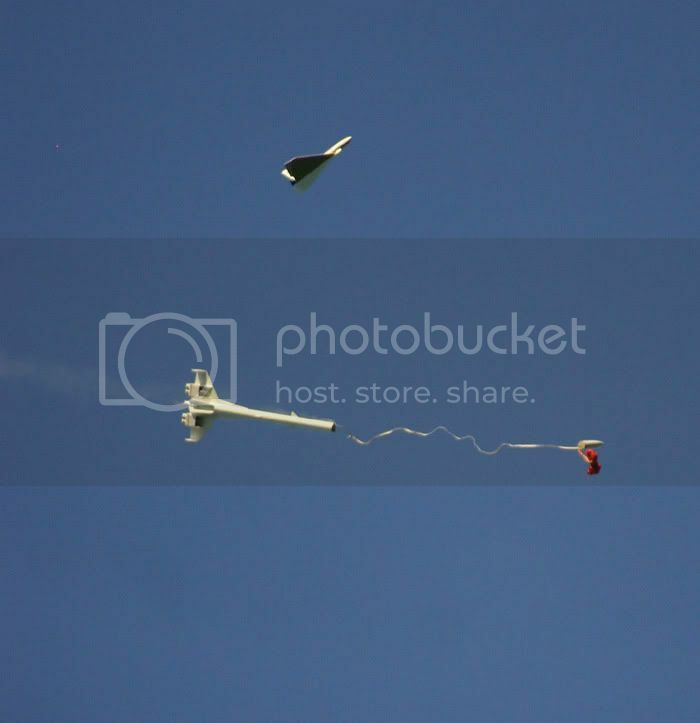 The glider came off and circled the sustainer which came down on a fully deployed parachute. The glider stayed in the air longer than the sustainer did. Both components landed within feet of each other.
. Both components landed within feet of each other. The only thing I did not really like about the OT was that it was still too much rocket and nowhere near enough glider....even the glider on a 4x upscale is smaller than some of my D powered gliders. Still very neat unless you are hopelessly 'corrupted' by size like I am. 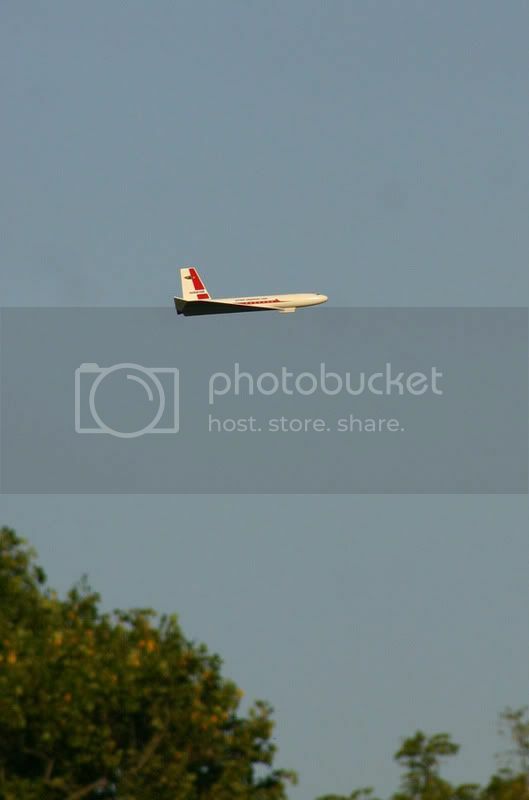 Great photo of the close landing of the booster and glider portions, and on a C motor no less! Why can't this happen to ME?? The OT is my all time favorite! Like a lot of you, I built my first one when I was about 12, and I still have it AND the original black and orange 18" 'chute. I fired it last in Orangeburg when the NSL was held there in '08. I have about 9 of the rereleased kits and 3 of the green-carded ones. Why, I can't tell you, except my self control is a bit lacking at times! Also, I have a Hawks Hobbies upscale that flies wonderfully on E15 motors. The glider flew what seemed like a half mile STRAIGHT downrange. Thank goodness for the little fellow that hollered to me, "I'll get it!" I gave him whatever he wanted out of my cooler! That thing flew over the crowd looking eerily like the space shuttle on final approach! 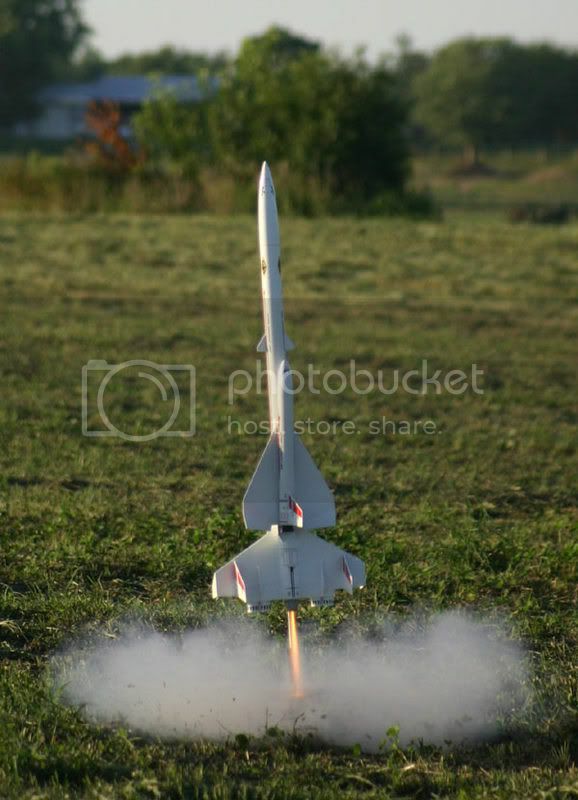 This may be enough to get my Semroc OT up higher in the build queue.....it, like the Trident that I'm currently building, are both ones that I wanted when I was into rocketry the first time but couldn't afford the time/money/space. Good to hear of an original that's still going strong. Estes Original Green-Header Skill level 4 kit. I think I'm going to move that Super Orbital Transport to #3 in my build queue just behind my "More Rockets" Star Speeder and the new Estes Saturn V.
My Super Orbital Transport will have the booster built with ALL EPOXY construction and the orbiter lightly filleted with epoxy to ensure thae ability to survive on a steady diet of RMS 24 E15, E28, F24, and F39 loads. May even put micro R/C gear in the orbiter for R/C glide recovery. Jason Ware, famous upscaler here in North Texas, has a 4x upscale OT that uses RC recovery on the glider as I recall. I'm thinking the Hawks Hobby kit would be a good candidate for that, too. Nice ones Bob. Glad you still have the fortitude to fly that 'ol thang! The OT has always been my favorite rocket to date. I scratch built my 1.68 upscale before Hawks offered one. Semroc provided the cones which weren't yet a stock item at the time I made the request. I thought the Hawks was a little too much money, but it's great someone offered a kit. This is one I wanted to see Semroc add to their SLS line of kits. Maybe now that Hawks isn't around anymore, they will consider it???? Carl???? I wish Quest offered parts at the time since their 30mm tube is a little closer to the correct size for the glider (and have a cone that would work pretty well), but the BT55 works just fine. I have one of the Estes newer re-releases in the bag, one cloned from BMS parts, one cloned from Semroc parts, and another Semroc kit. Sadly, I don't have my original anymore. Here is my upscale. Flies great on Estes D12-3, and Aerotech D15, E11. Last edited by foose4string : 09-02-2010 at 02:33 PM. Awesome pics, Foose! Just great! Very nice upscale! Love the one of the glider with the large tree in the background!